Say hello to big poppa. Sometimes, you just need to go big. Sometimes, you need to cash in the retirement savings, throw your neighbours’ concerns to the wind, and invest in a sound system that is going to blow your windows off. Step forward, then, the Marantz SR7011, an absolute beast of a receiver that is designed to be the giant, hulking quarterback of your home theater setup. In this review, we break down the Marantz SR7011’s sound, design, packaging and accessories, specs and more. To see how it stacks up, see our list of the best A/V receivers. First thing to note here: the Marantz SR7011, while still a highly respectable receiver, has been updated twice. You can get the beefier 7012 and 8012 models now, but they’re expensive, and we think that this receiver will still do a good job for most people, at an absolute knockdown price - $1,399 at the time of writing, less than half the cost of the $2,999 SR8012. Now for surround sound. Deep breath. The 9.2-channel SR7011 can handle Dolby Atmos, DTS:X, and Auro-3D (with a paid upgrade). It’s got Bluetooth streaming, WiFi streaming, Spotify and Apple Airplay. If you have any Denon HEOS wireless speakers, it can slot right into your existing system. It plays high-res audio, HD radio, and is quite happy reading files offer USB stick. In short, if you can think of a way to transmit sound, the SR7011 can probably handle it. And if we were to go into an exhaustive list of absolutely everything it could do, you’d mistake this review for a spec sheet. So let’s just say this. We tested the SR7011 extensively. We put it through just about every scenario we could think of. Our workhorse system was a customised Pioneer SP-PK22BS Andrew Jones 5.1 (full review here) that we modified with a couple of additional satellite speakers, including a pair of SVS Prime Elevations (full review here) to serve as height units. While we didn’t get to a full 9.2 system – we had to stick to 9.1, or we’d get thrown out our building – the volume and quality of sound that came out of our set up convinced us that we didn’t need to. We stuck mostly to Dolby Atmos settings, and we were particularly dazzled by the height effects. Admittedly, our Prime Elevations are generally pretty good at this, but even so, it was a real pleasure to be immersed in such dynamic surround sound. We were a little bit worried that this unit might not distinguish itself from other receivers, in terms of sound, but again, we needn’t have. In all circumstances, the sound was rich, full, and powerful. In the multiple movies and series and video games we watched and played, it never felt forced. Explosions, kicks and punches had heft and weight, without being overpowering. More importantly, effect placement throughout our speaker system was never less than excellent, and although we listened hard, we couldn’t fault it. It didn’t put a foot wrong. It’s got a continuous, average power output of 125 watts per channel at 8 ohms, and can safely drive any speaker down to 4 ohms. In terms of power output, then, it’s extremely healthy - compare it to something like the Yamaha Aventage RX-A3070, which puts out 150 watts at 8 ohms. That amp costs $2,000 to the SR7011’s $1,399, and you’d expect it to have a massive increase in power. Not the case - and that’s because the SR7011 is a beast. The calibration for our room worked brilliantly, and the Dynamic EQ ran in the background to normalise the sound, making sure that things were at a nice even level throughout. Although it is possible to control the levels of the individual speakers, we found we didn’t have to. The software had worked out exactly what we needed, and done its job faultlessly. The EQ, by the way, is the excellent Audyssey MultEQ XT32. It’s possible to nitpick. After extended listening, we found ourselves wanting a little bit more detail in the highs, and very occasionally, we lost a little bit of dialogue in the middle of intense action scenes. But really, these are minor points, and we can easily imagine them vanishing on a different system or room shape. When sound is this good, this crystal clear, and this effortless to achieve, it’s hard to be too critical. And if you want receivers that can put out even crisper sound, try the ones on our list of the best receivers of this year. Again, we should note that we did not test this at its upper levels (9.2, expandable to 11.2), because we really don’t feel like losing our security deposit. We also didn’t have the necessary height speakers to test its Auro3D capabilities. That being said, we don’t consider these big deficiencies. Given how well the receiver performed, we can’t imagine there being any serious issues with either of these. Overall, the performance was just phenomenal. Most home theater receivers look similar – so much so that one could be forgiven for thinking they all come from the same parts factory, and are just assembled to order. While the Marantz SR7011 probably slots into this bracket too, it’s got enough clever features and sleek design to set it apart from the pack. It’s virtually identical to its predecessor, which you may be completely shocked to hear was called the SR7010. While it does share the same black box design of almost all receivers these days, it still looks good. The front is dominated by a central, circular LCD display that shows the input, and which glows a reassuring blue when you turn the receiver on using the power button on the bottom left, which happens with a satisfying clunk. Two large knobs are on each side of the central display. The left-hand one controls the input, and the right-hand one controls the volume. You probably won’t use these very much, as all adjustments will almost certainly be made with the remote control, but they work well. At first glance, it appears that that’s it for the front-end – until you flip down the lid to reveal a hidden section, housing the most commonly-used controls. These include, among other things, an extended LCD display which shows more information than the central one, twin headphone jacks (3.5mm and 6.3mm), a USB port and an HDMI-in port (we’ve got more on HDMI here). Again, you probably won’t end up using this front end, and it makes total sense to us that it’s hidden away until needed. As a matter of fact, we give the front end of this machine top marks. It’s sleek and elegant, giving you only what you need at a given time, and hiding the rest away. Flipping around to the back, there is a bewildering array of ports to get to grips with (although we have a full guide to the various connections on your A/V receiver – which coincidentally, uses this exact model to illustrate it!). If there’s a way to connect something related to audio or video to this receiver, Marantz have included it. You can plug HDMI cords into the seven inputs (eight, if you count the front) and three outputs. You can screw in two antennas to connect to your home Wi-Fi network or via Bluetooth, and stream music. You have an entire preamp section, and enough connections to allow you to expand the system to a full 11.2 setup, or even such esoteric configurations as 5.1.4 or 7.1.4. You can, if you’re so inclined, get the receiver to control the raising and lowering of a projector screen, add an external controller like a PC mouse, or even add an additional remote hub. This is where it really gets fun. Once you’ve got this monster plugged in correctly and turned on (something that is surprisingly easy, thanks to Marantz’s excellent online manuals and paper quick-start guide), you get to play with the included calibration mic. This requires that you assemble a dinky little cardboard stand – actually, we found that a bit annoying – and place the mic on top, then put the whole thing in your listening position. This proved a bit of a challenge, as the mic wobbled when positioned on our couch cushions, but it got there in the end. Marantz includes the MultEQ XT32 from Audyssey in its built-in software package, and it works like a dream. It was almost uncanny just how easy it was to navigate through the on-screen menus and calibrate the system for the room. Instructions were clear and simple, with zero room for ambiguity, and helpful hints when we did get stuck (such as, for example, a rogue speaker that we’d wired incorrectly). You see similar setups on receivers like the Yamaha RX-A870 Aventage, albeit under the banner of YPAO (Yamaha’s proprietary tech). It’s more common than it used to be. The thing we were worried most about – that this leviathan would prove impossible for beginners – proved unfounded. Setting it up was a total breeze; the hardest thing was actually winding the speaker wire around the back of our bookshelves. Even once we got going, navigating through the simple menus and calibrating the system to our liking was dead easy. Even if you can’t tell a 9.2 from a 7.1.4, Marantz will sort you out. It even allows you to customise different zones and different listening rooms, although this does take a little bit of work. Still, if you have multiple areas in your house that require sound, then the option is very much there. We did wonder whether such simplicity would feel a little bit condescending to the intended audience for this receiver, who no doubt do know a 9.2 from 7.1.4, and can probably educate you on the finer points of custom home theater installs. But you know what? We could never, ever take marks off for something being easy-to-use. So in terms of setup, the SR7011 again scores high. Yeesh. This is where it gets ugly. While we understand the system this big and feature packed needs to be protected, which means we are okay with the vast amounts of polystyrene and the huge cardboard box, we are less okay with the dozens of separate plastic packets containing various notices, instruction manuals, advertising cards and, for all we know, organ donor forms. It’s a central irony that while Marantz includes an intelligent ECO power saving mode on the receiver itself, they’re probably using enough plastic in each box to keep a garbage picker busy for years (you can read a more detailed technical discussion on ECO mode here). This kind of thing might have flown in the 90s or early 00s. It’s not cool now. Not only is it environmentally unfriendly, but it’s deeply annoying to have to dispose of. The mic used for the room calibration is small and simple, rising to a tapering point and slotting easily into the constructible cardboard tripod. Its cord is long enough to allow you to position it in just about any listening position, which is a big plus. Although the bulk of the heavy lifting is being done by the software, the microphone gets the job done. We are less enthusiastic about the remote. Oh, it works fine; it allows you to access all the functions you might need, and it comes with a handy digital display at the top. But the thing is, for a system that seems so well-designed, it’s hard not to look at the remote and cringe a little. Marantz have packed so much on there, so many zillions of buttons, that even familiarity with the remote will leave you pausing for a few seconds while you find the right button. We are not saying all this stuff doesn’t have to be on there, but there must be a better way. The best receiver remote, in our opinion, is found on the Denon HEOS AVR - it’s as simple as it gets. As if they’d thought about this after they’d already OK’d the final design, Marantz have an excellent AVR remote app (iOS and Android) that allows you to fully control your system from your phone. We much prefer the app to the remote – it works brilliantly. Marantz have also thoughtfully included a list of colored, labelled stickers that you can affix to your speaker cords, allowing you to line them up with the right terminals on the backend. It was such a pleasure to be able to banish the chaotic nest of wires under our TV, and it’s a mark of just how much thought Marantz have put into this. Never has a system made life this easy. The SR7011 makes setup a breeze, with excellent room calibration software that really fine-tunes the sound quality. The design of the receiver is solid, managing to be both functional and attractive. It’s versatile, with a good range of connections and features. If you can think about it, you can probably connect it. ​9.2 channels is more than enough for most people, and 11.2 and Auro-3D upgrades are possible. Not a massive upgrade on the SR7010 - and this is a problem which bled through to the subsequent SR7012 and SR8012 models. The SR7011’s remote could be a lot better - we’d like to see some improvements here. ​There’s just far too much packaging for the receiver, with too many things you need to throw away. *V = Various versions of the surround codec in question - too many to list here, or it would break our table. See manufacturer sites for the full breakdown. **All wattage ratings are for two channels driven (with the exception of the NAD), which is what manufacturers commonly list. If you’re running all channels, expect the wattage per channel to be a little lower! (Update and correction: In the original review, we incorrectly stated that the Audyssey EQ was a new feature. It is available on the 6010 and 7010 models too. We are happy to correct this error). Because this receiver is a little old now (we first reviewed it back in early 2017) we have no problem recommending some newer models. Chief among these is the Yamaha RX-A870 Aventage - a newer Yamaha model that has a lot to recommend it. It’s got excellent sound quality, and is known for playing well with a wide variety of speakers. It advances Yamaha’s audio tech, using the A.R.T (Anti Resonance Technology) Wedge to control vibrations. And like many receivers these days, you can control it with Amazon Alexa - something the SR7011 can’t boast. A second alternative: the excellent Sony STR-DN1080. It’s a model line that has really stood up, and we think it offers better value-for-money than the more expensive (even now) SR7011, which costs $1,399 compared the Sony’s $498. You get an excellent user interface, with some truly great sound quality to go with it. Unlike many receivers, it even has DSD functionality, allowing it to play high-resolution audio files. That’s common among stereo amps, but not among A/V receivers. If that’s something of value to you, this is the one to go for. Then there’s the Denon AVR-X4300H. It’s become one of the go-to receivers for many listeners, and Denon themselves have really been giving the receiver game everything they’ve got. They’ve recently released a 13.2-channel model, which is overkill of the best sort. This model doesn’t go quite as far, but it still hits hard: a full range of surround codecs, a good price, and sound quality that more than squares up to the SR7011. Be warned though: it has an awful remote. Finally: no point mentioning the SR7011 without talking about the newer model. 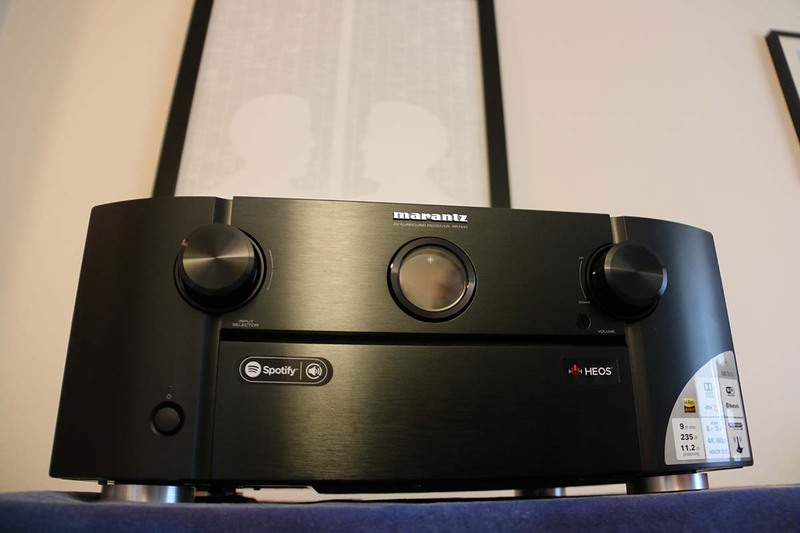 The Marantz SR8012 may be expensive - $2,999 at the time of writing - but it’s got everything you could possibly need in a receiver. Alexa control? Check. 11.2 channels? Sorted. Dolby, DTS and Auro-3D? You got it. Our problem is that we don’t think it’s enough of an upgrade from its predecessors...but maybe we’re overthinking this. It’s still a monster.